Many friends of AICR want to do more to fight cancer, but can't afford large one-time gifts. The Monthly Giving Program is a great way to make your gift go further, with an automatic recurring donation from your credit card or bank account. 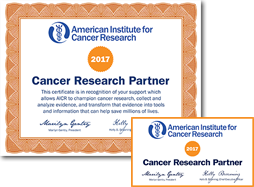 Becoming a Cancer Research Partner is a great way to make a significant impact in the fight against cancer every single day. Your monthly support ensures that vital cancer research, prevention and survivorship programs continue. It's easy, secure, and you can change or cancel your monthly pledge at any time. Advances Knowledge by translating the latest scientific findings into practical tools for health professionals, and practical advice for all of us. Advances Hope by raising awareness and getting the word out: there are things we can all do to reduce our risk of cancer and lead healthy lives. You can honor the memory of a loved one while helping to lower cancer risk for so many others. Enroll now to give a monthly memorial gift. "Monthly payments in memory of mom work well since I think of mom more than just twice a year." to go in to your Monthly Giving Service Center. It's easy to enroll with a credit card using our safe and secure online form .